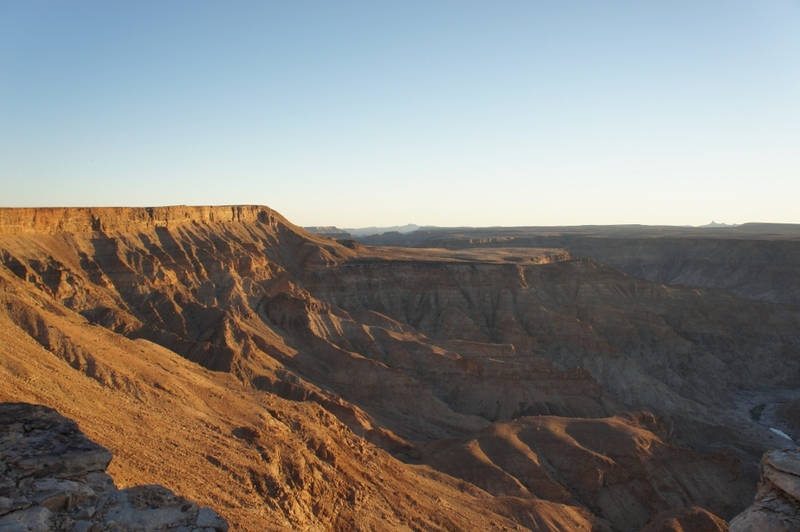 Our overland truck stopped in Swakopmund, Namibia for three nights in hostel accommodations so the group could do laundry, run errands and participate in several adventure activities. 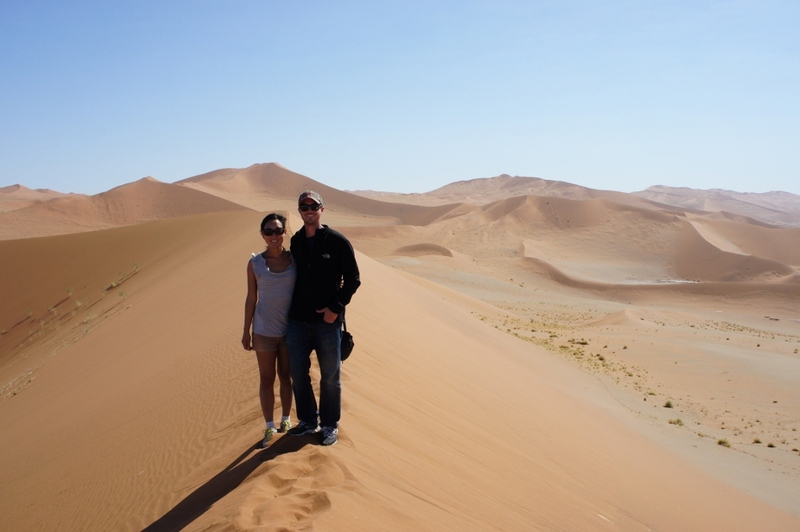 Between the two of us, we’ve already experienced these main attractions in other places (sandboarding in Peru, skydiving and quad biking) so Chis and I took the time to sort out our insurance claim. We had one group dinner out on the town which was followed by a trip to the karaoke bar and a Namibian club for some dancing. Down the road from the hostel was the Mermaid Casino. Chris agreed to give me a whopping 300 Namibian dollars over the course of two days to play with. Nothing is more fun than winning free money. Well, I lost it all ($30 USD) in my failed effort to grow our travel budget so no cocktails for me for the next few days! 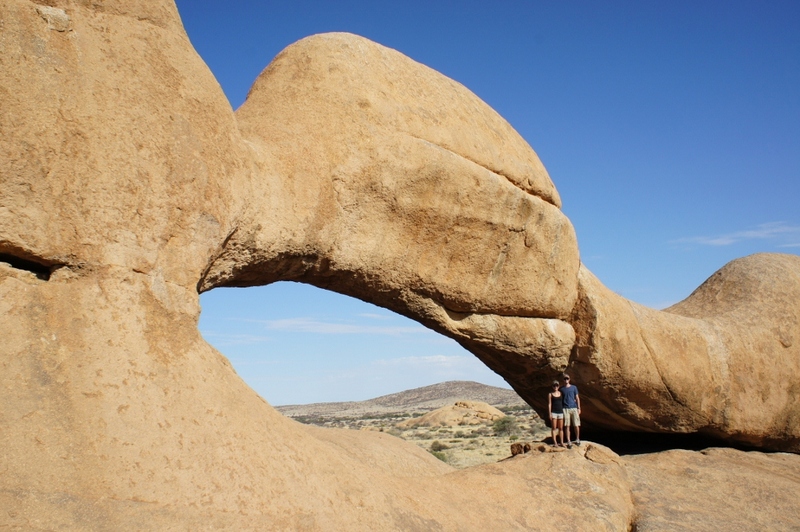 The next evening we drove to a bush camp in Spitzkoppe which is most recognized for its desert rock formations. 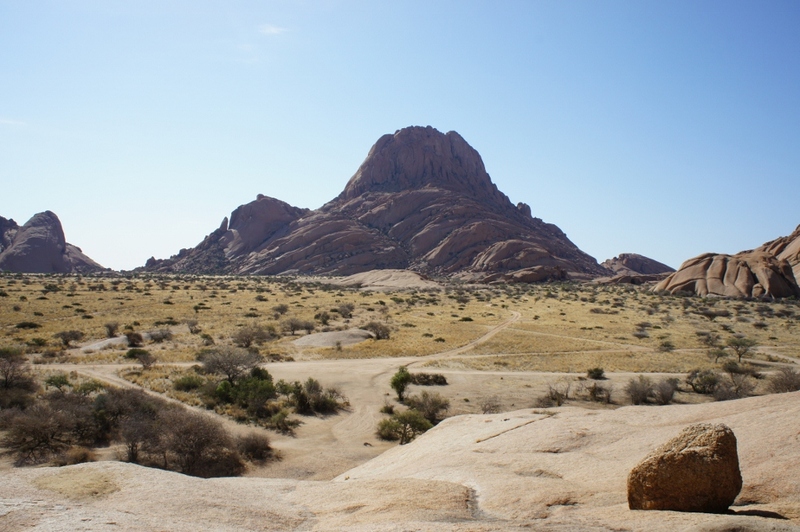 It vaguely reminded us of our trip to Joshua Tree National Park in southern California. 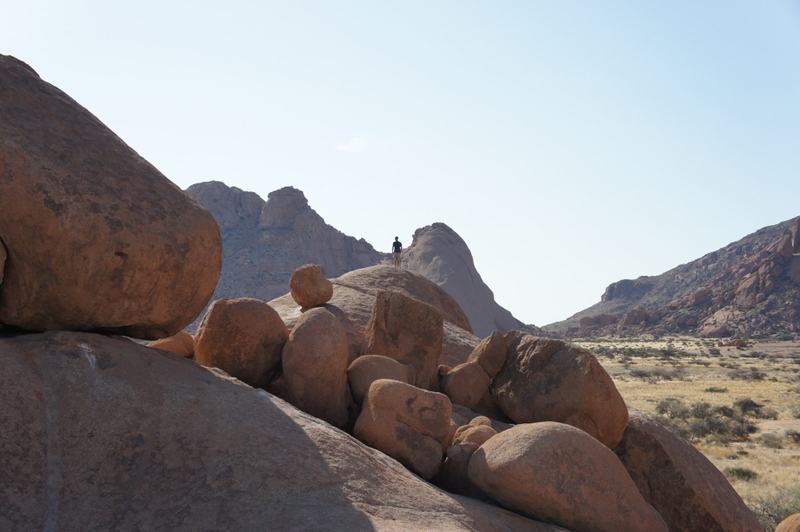 We spent the day hiking around the boulders and climbing up the rocks. 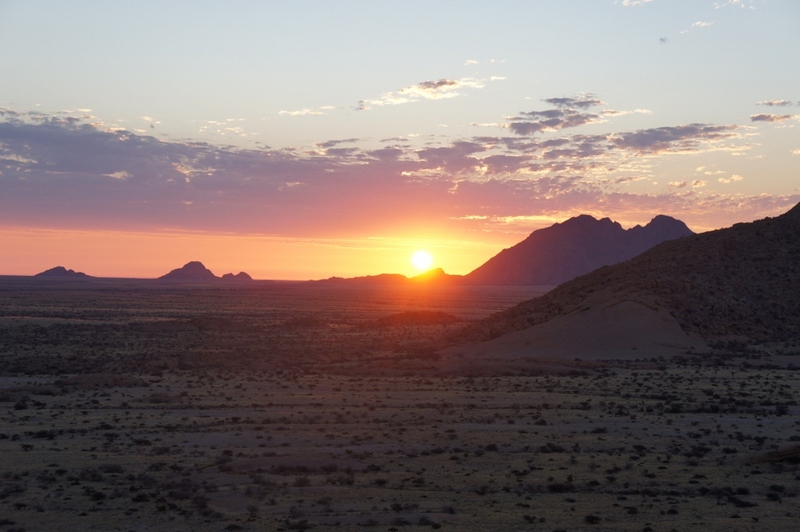 We caught the sunset at the top of a large rock formation that peered out over the sprawling desert landscape. 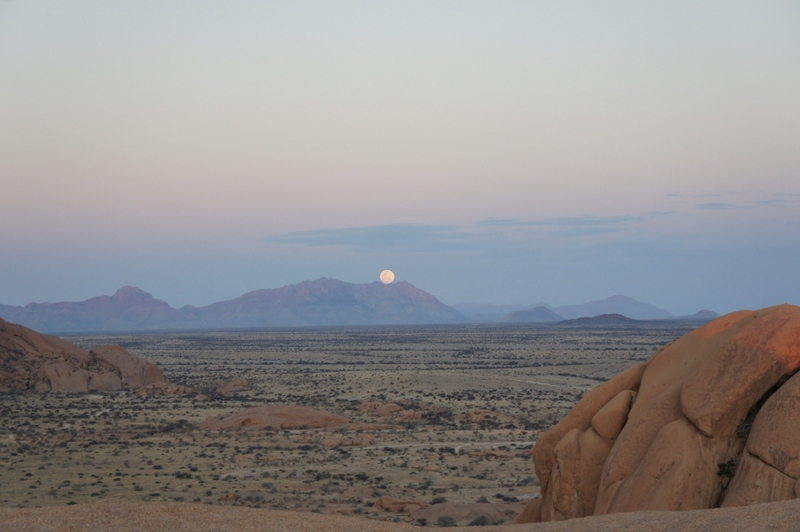 As the sun was setting in front of us, the moon was rising behind us at the same time. It was an incredible sight to see. Instead of pitching a tent, a group of us climbed up to a flat rock with our sleeping bags and pads and slept under the full moon and stars. Back on the truck, we stopped along the road where an indigenous community was selling handmade jewelry. The people lived in small huts nearby and wore only loin cloths to cover their private areas. They would rub red mud on their hair and bodies as their method of bathing and to keep themselves cool under the hot sun. 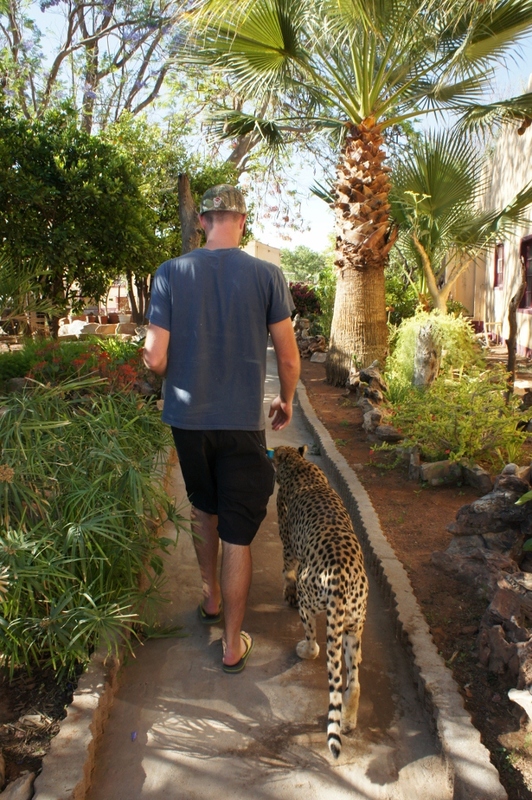 We continued driving until we reached our campsite set within a cheetah park. 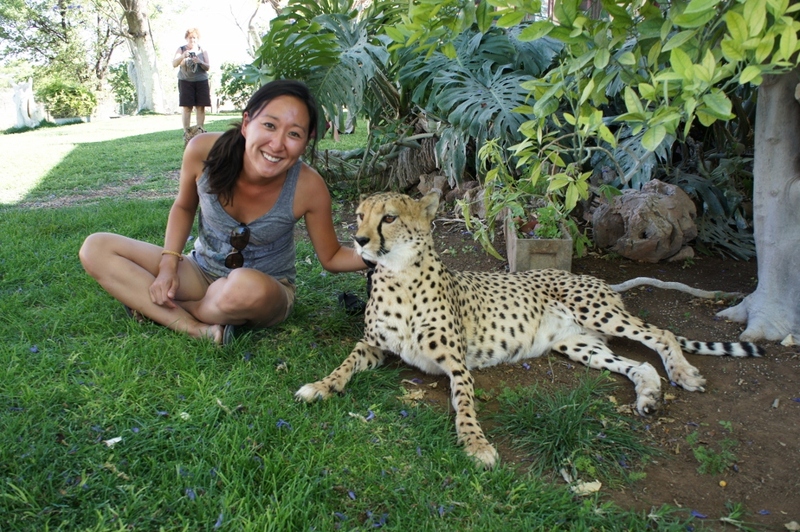 We spent time playing and petting three domesticated cheetahs and one cheetah cub. 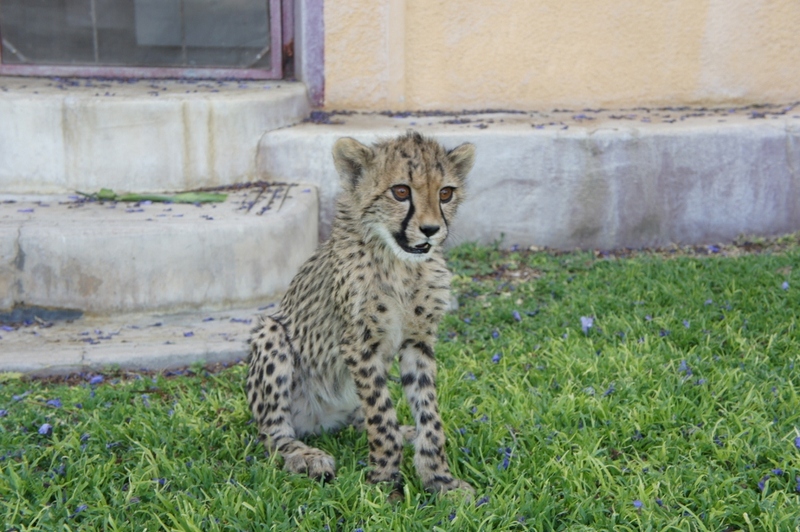 These cheetahs have been raised with domesticated dogs for their entire lives but still have their natural animal instincts. When they purred, it resembled more of a low growl. 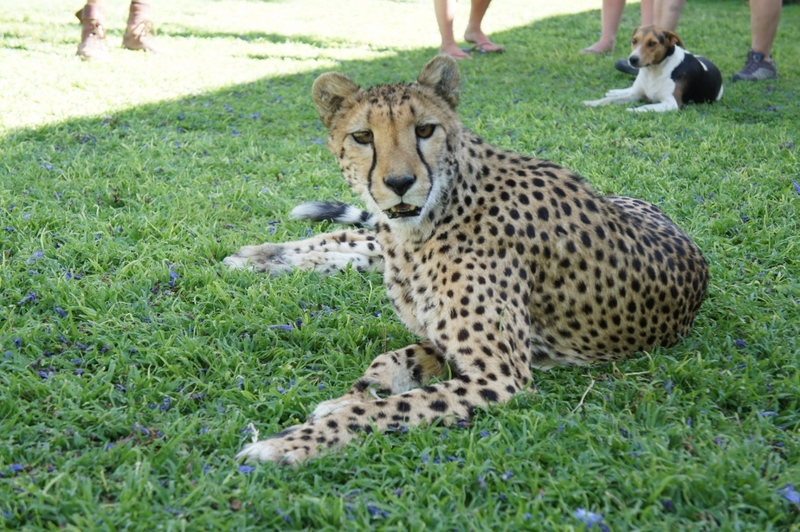 We piled into the back of a pickup truck to drive around the adjacent sanctuary where wild cheetahs roamed. With a bucket full of donkey meat, we watched as the cheetahs started to stalk the truck for food. 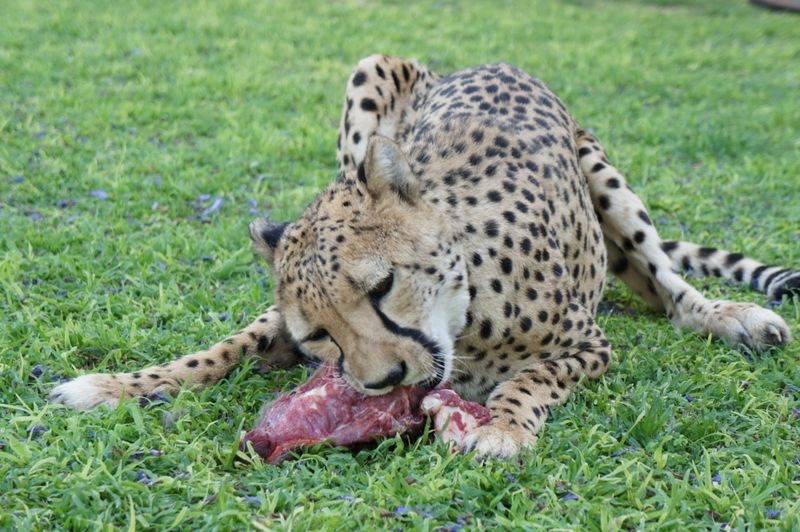 The meat was hurled into the air as the cheetahs fought for it and once successful, would trot away to savor its catch. 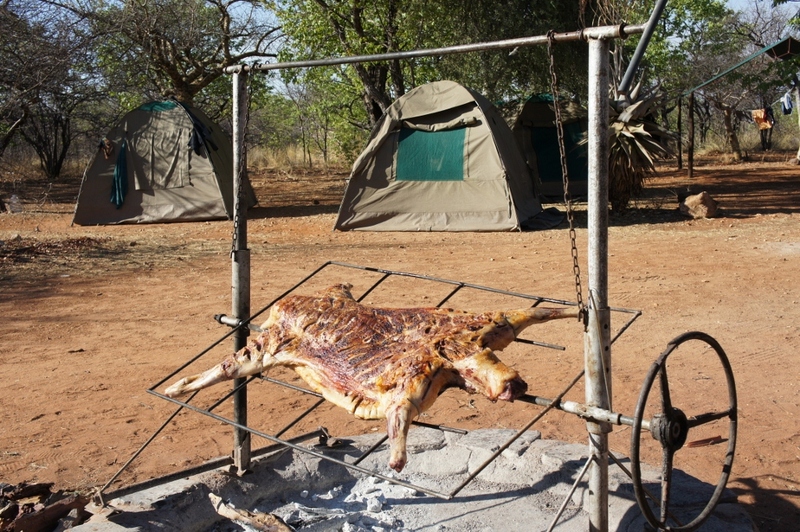 For dinner (and the subsequent two meals), we enjoyed a whole lamb cooked right on the spit in our campsite…delicious! 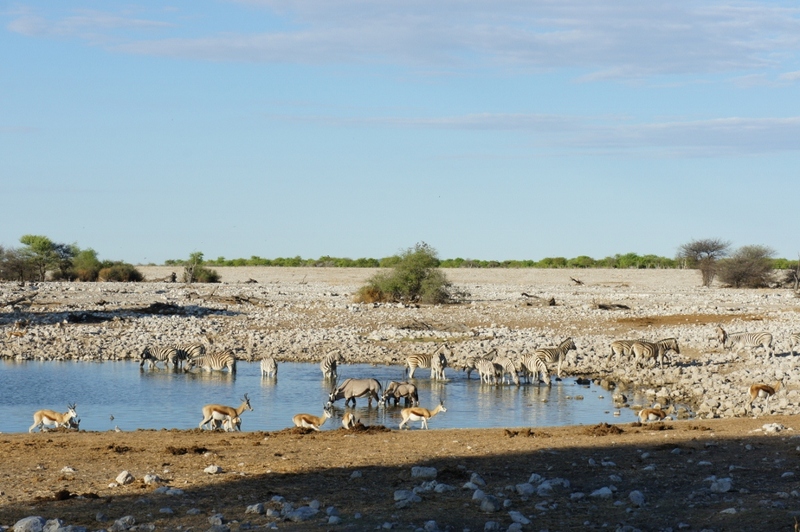 Our last big stop in Namibia was Etosha National Park. 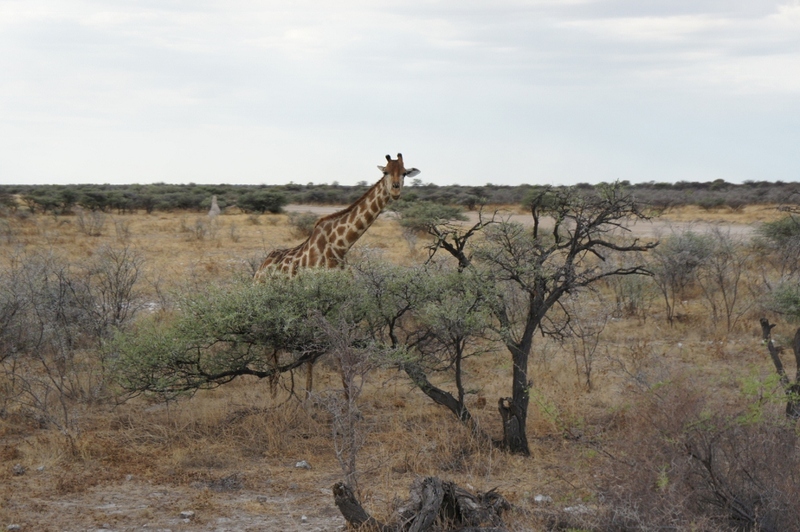 In two days, we had three scheduled game drives that were each four hours long. 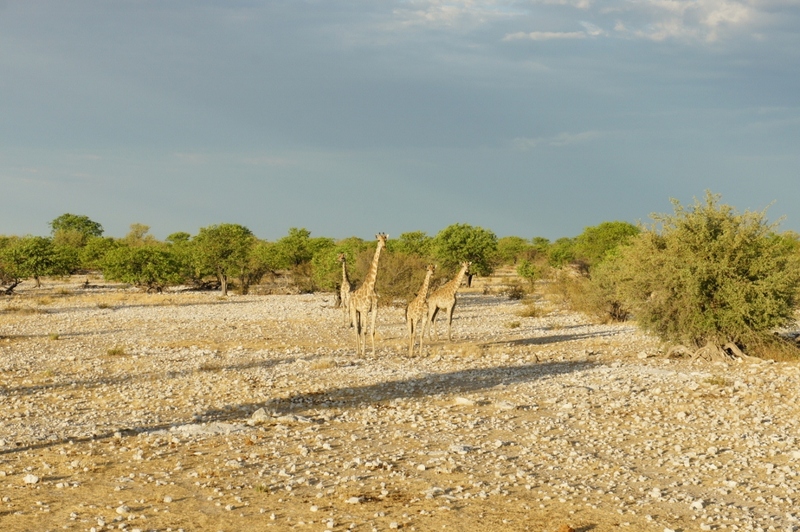 We saw so many different types of animals and birds we thought we’d just share a few highlights which included herds of giraffe, hundreds of zebra and a small family of lions. 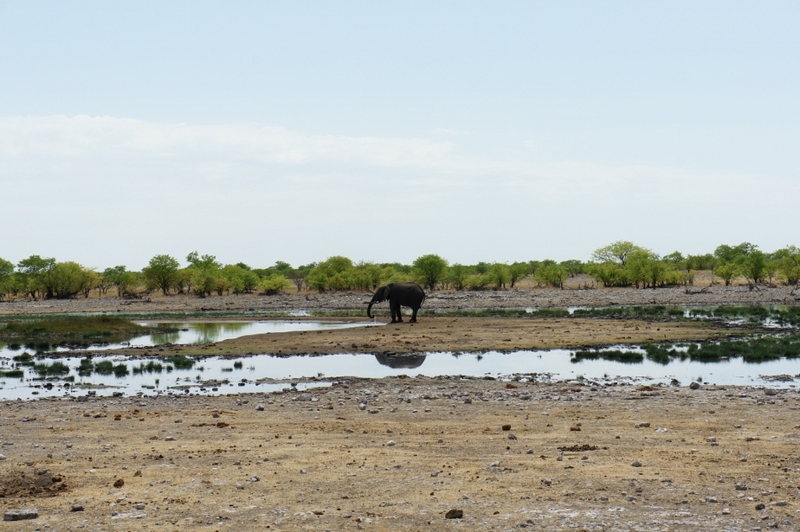 We stopped at a watering hole where we spotted a lone elephant. 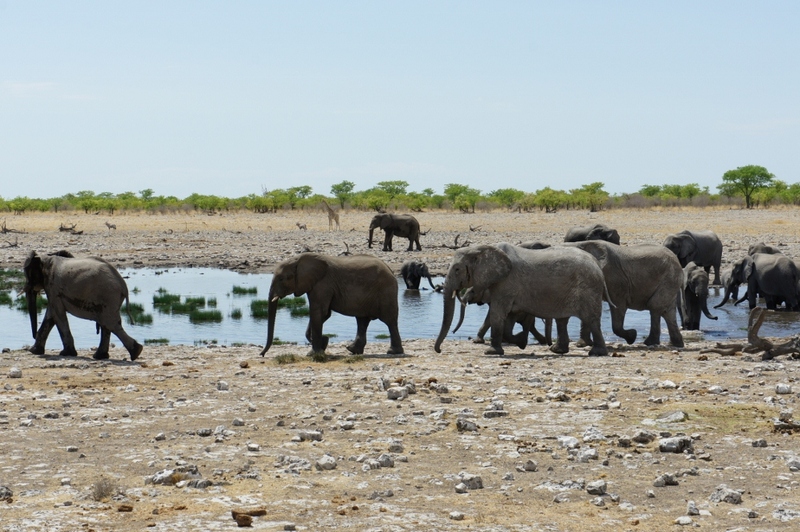 Within minutes, herds of elephants emerged from nearby areas. 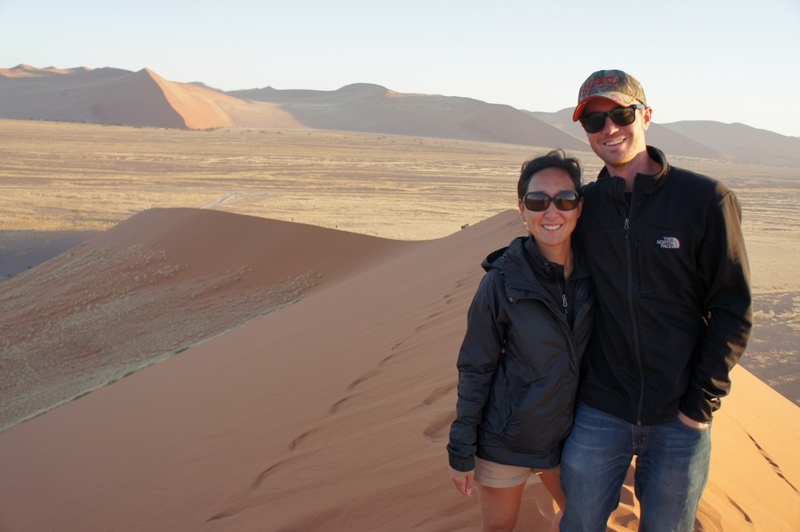 We saw three of the “Big Five,” which are the most dangerous animals in Africa to hunt. 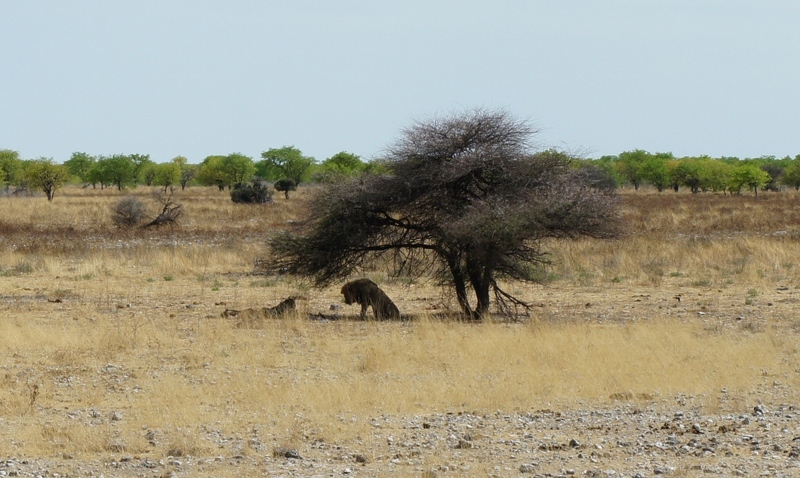 The three we spotted in Etosha were elephants, lions and two black rhinos. 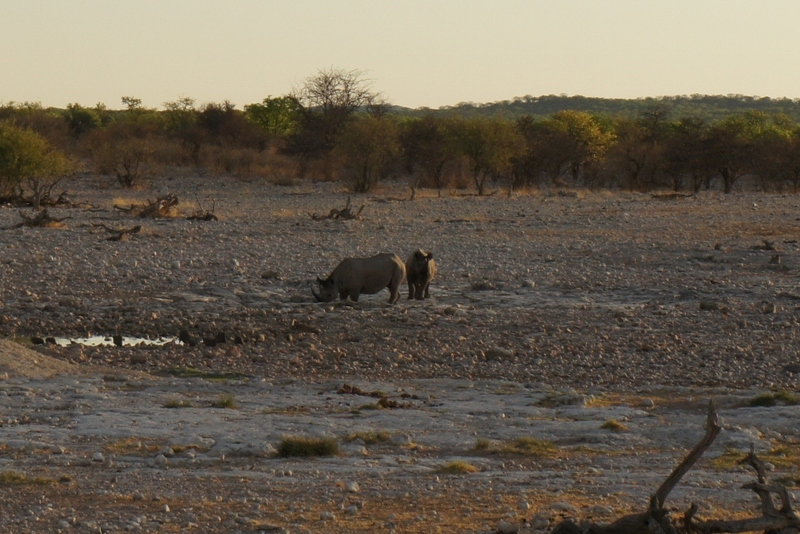 We were so lucky to see the black rhino which are hard to spot because they are becoming increasingly endangered. Most people claim to see all of the Big Five but what they normally spot is the white rhino. Only 5,000 black rhinos are left in the world and it’s expected they will become extinct within four to five years. We have not seen a leopard or a cape buffalo yet (the remaining two of the Big Five) but hope to check these off the list in the Okavango Delta, Chobe National Park or in the Serengeti. 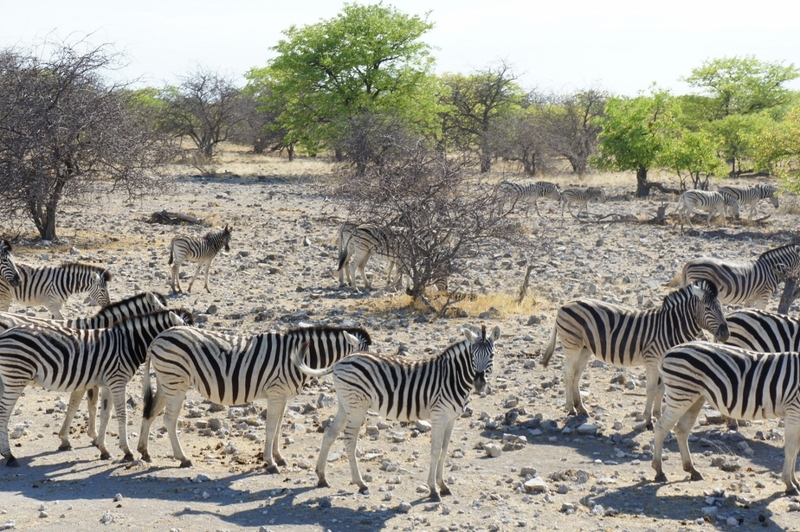 After an amazing week in Namibia, we are off to our next country…Botswana! Still reeling from the previous nights events, we boarded the truck for our 42 day overland tour with a trip leader, cook, driver, 12 others from all over the world (China, Korea, Germany, Australia, South Africa, England and Canada). 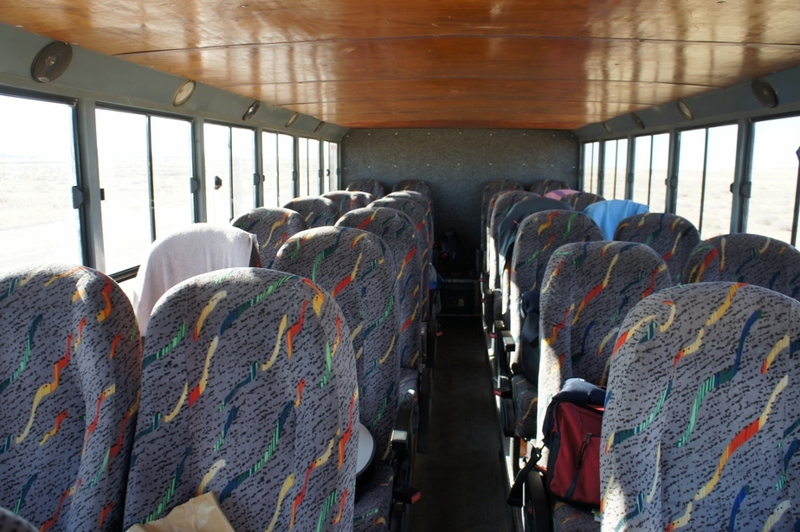 The overland truck seats up to 30 people so we each have two seats to ourselves for a little extra comfort. 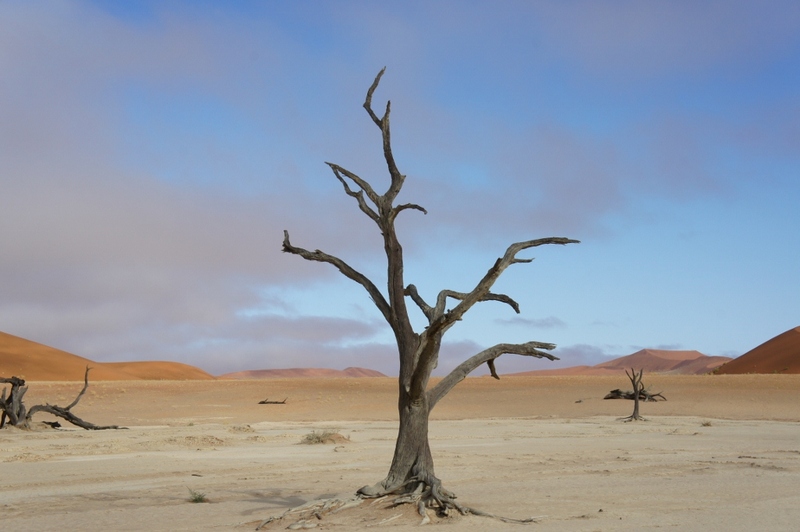 This will change in a week once we pick up more people in Swakopmund, Namibia. 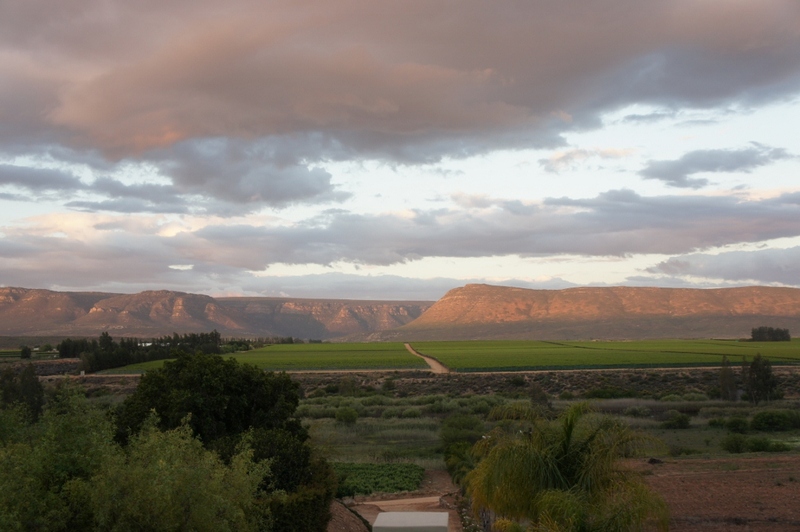 Our first destination was the Cederberg Area just a few hours north of Cape Town. We pulled into our first campsite and were completely surprised at the level of accommodations. Our camp was set within a gorgeous winery. 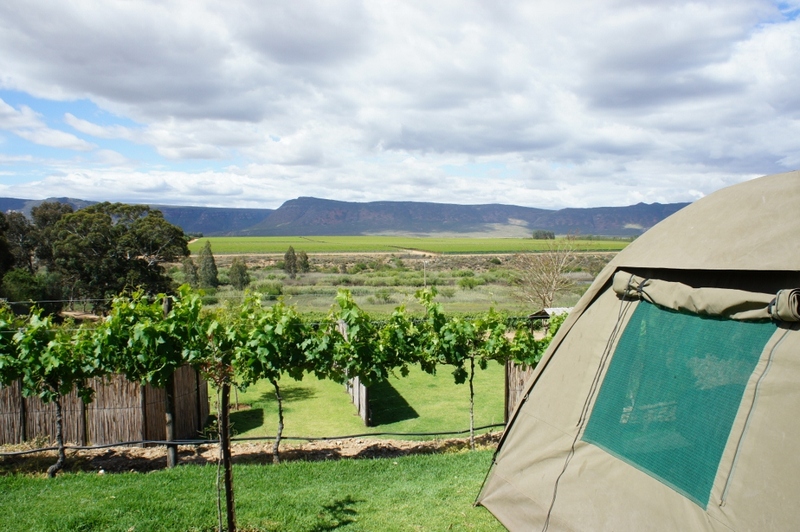 Grapevines and soft lush grass provided a beautiful and comfortable spot to pitch our tent for the first day. After setting up camp, we enjoyed a wine tasting and sunset over the vineyard farms at the campsite bar. It was stunning and definitely rivals the natural beauty of Sonoma or Napa. 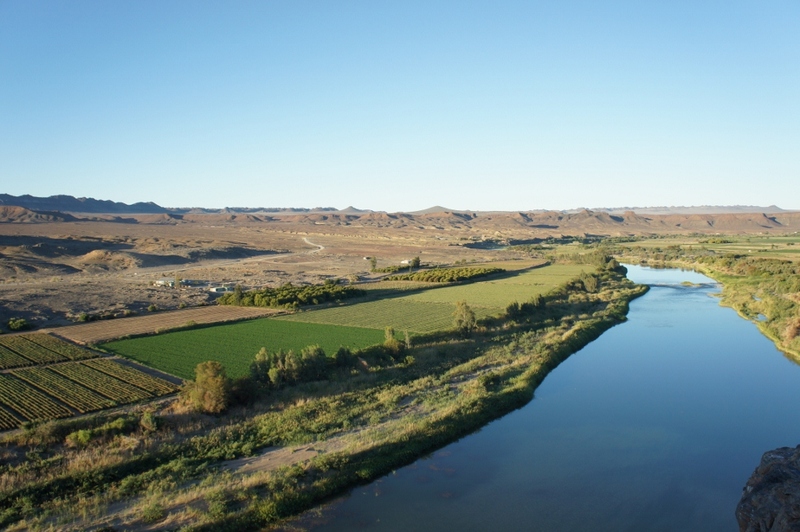 We awoke, broke down camp and kept driving until we reached the Orange River which creates a natural border with South Africa and Namibia. 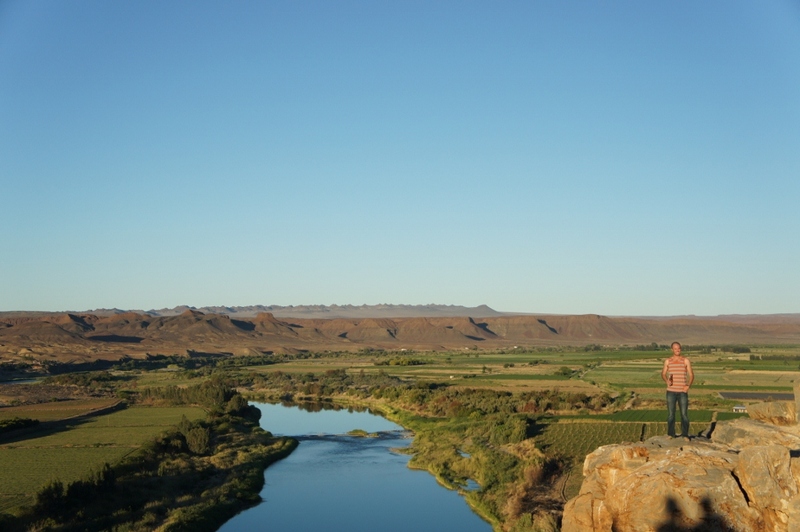 Once we settled into our campsite for the evening, we walked to a nearby cliff above the Orange River to take in the sunset over the surrounding areas. 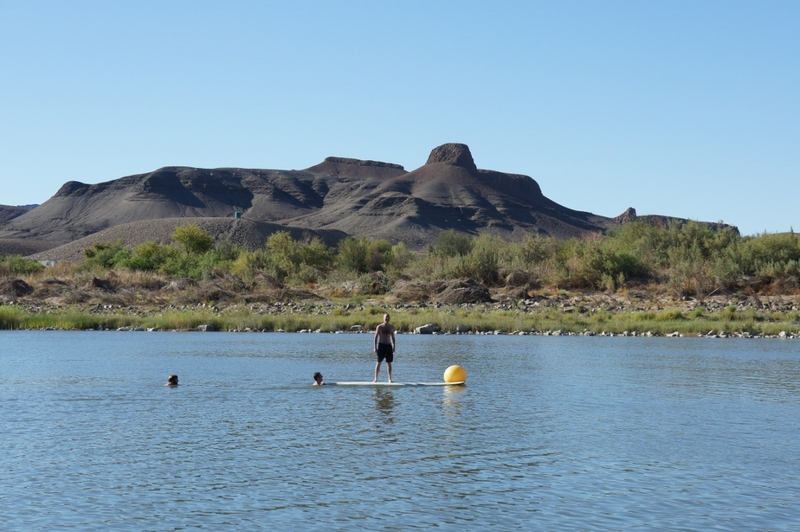 Days are very dry and hot so we spent most of our time in the Orange River playing with the dogs that lived at the camp. While swimming in the river, Chris lost his wedding ring. He searched in vain for his ring in the dark four foot deep water. It was just the icing on the cake after losing all of our other possessions. We joked that part of us will always stay in Africa and that perhaps the De Beers will eventually find the ring and resell it. 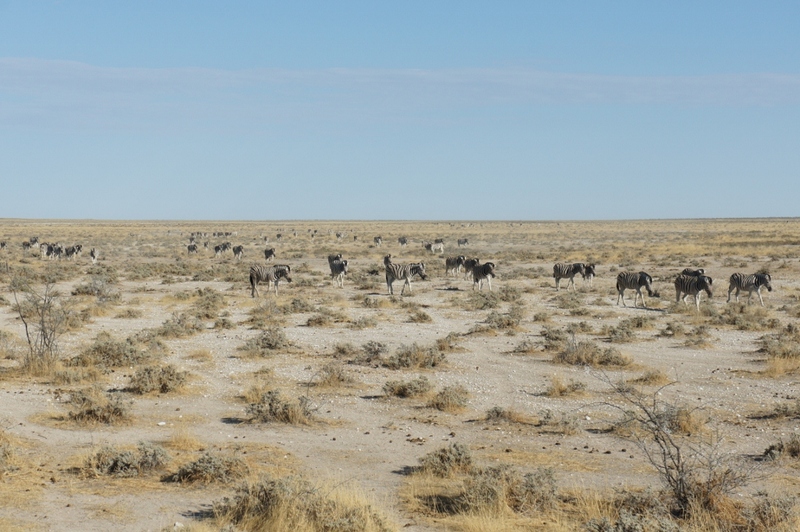 Later that day, we crossed the border to Namibia. 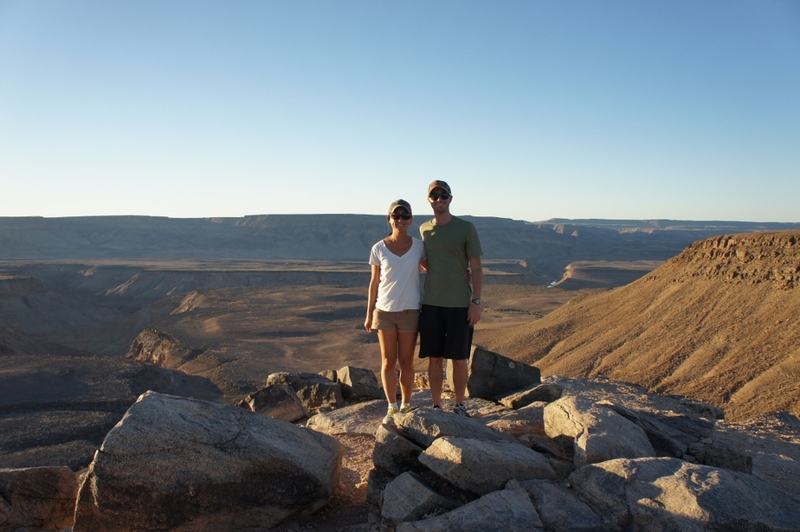 The truck took us to Fish River Canyon, Africa’s largest and deepest canyon where we hiked along the rim and took in another beautiful sunset. 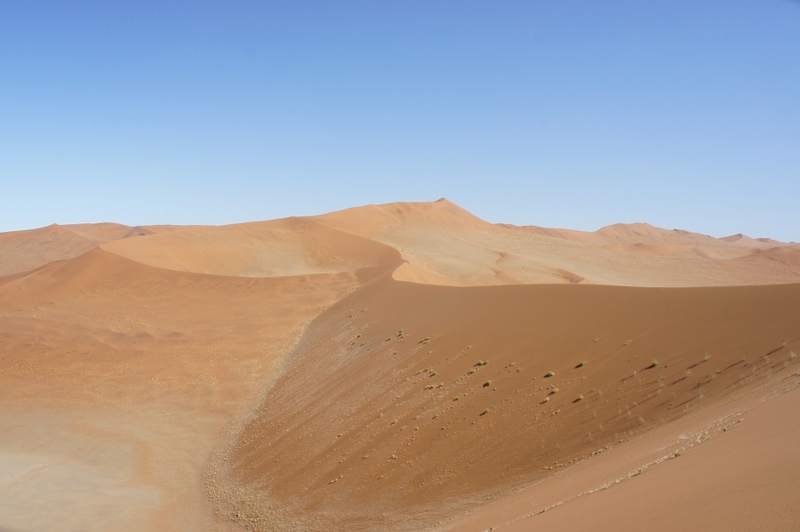 While in Namibia, Chris and I and a few others had a four mile run under the hot African sun. 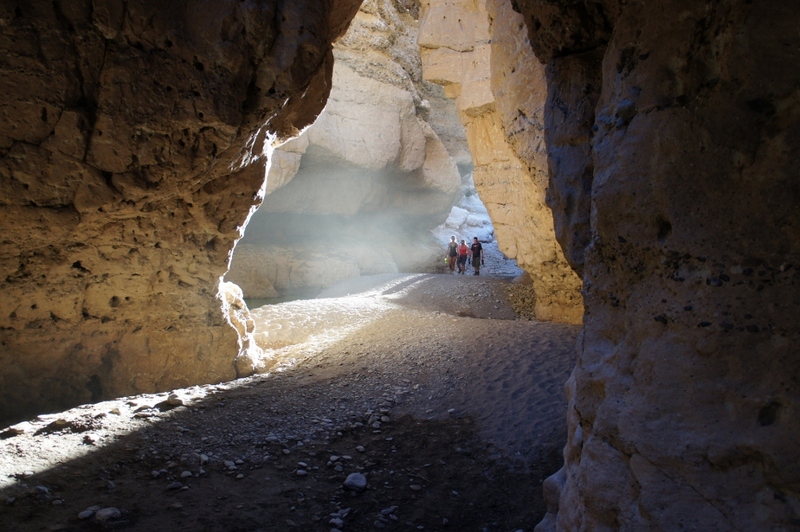 We met up with the rest of the group to walk through the Gariep Canyon. 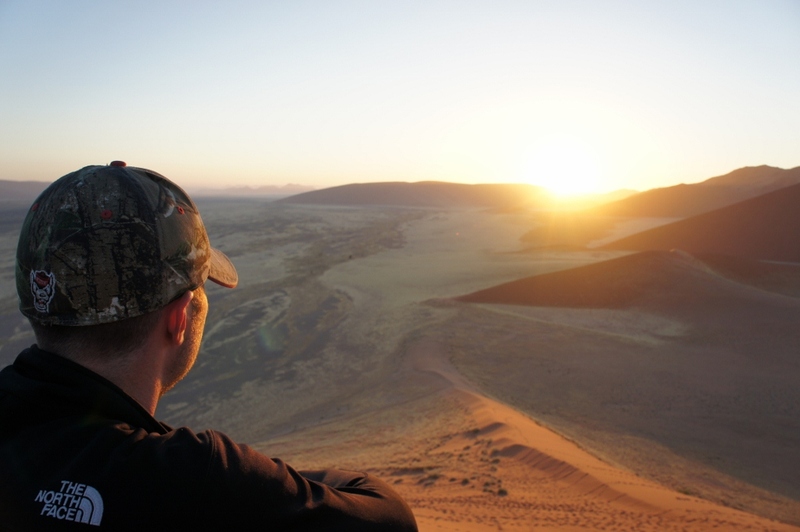 The following morning, we climbed up Dune 45 to take in our first African sunrise. 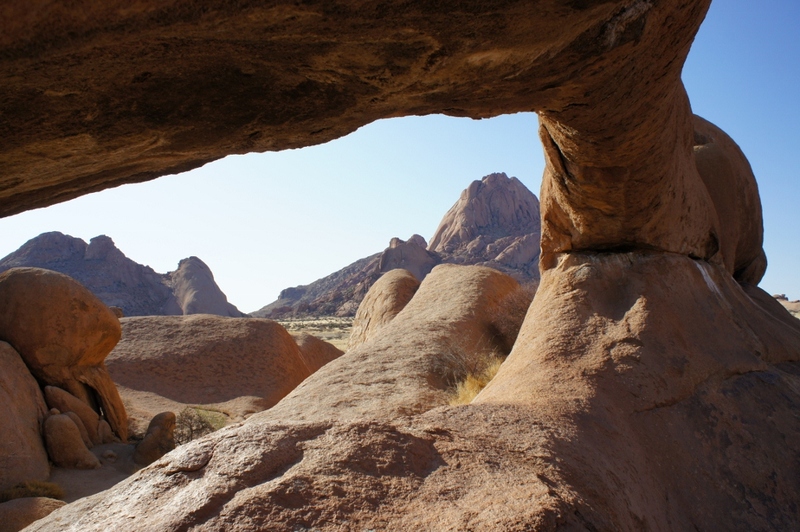 It was a beautiful site as the sun lit up the surrounding red sand mountains around us. 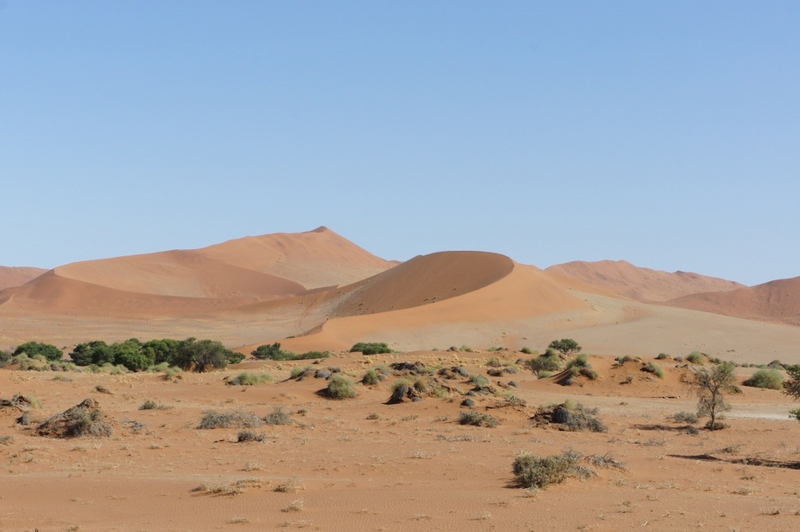 We took a smaller overland vehicle a few miles further into the dunes to Namib-Naukluft National Park. 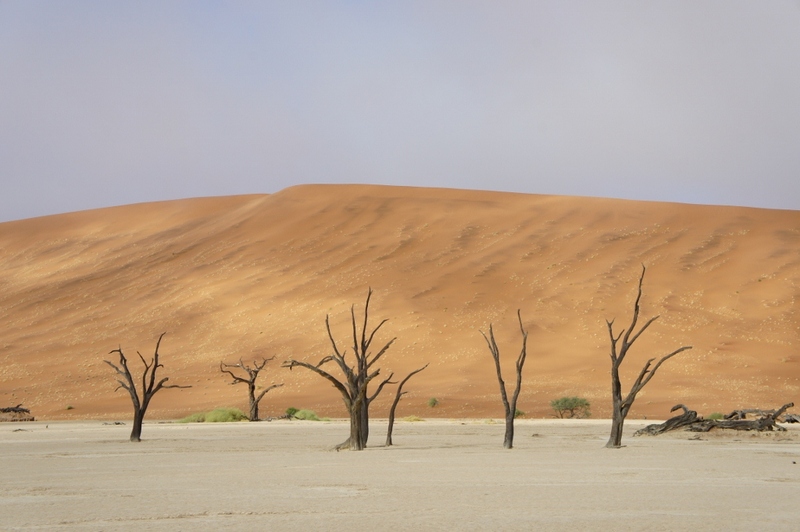 The park is home to an area known as Sossusvlei. 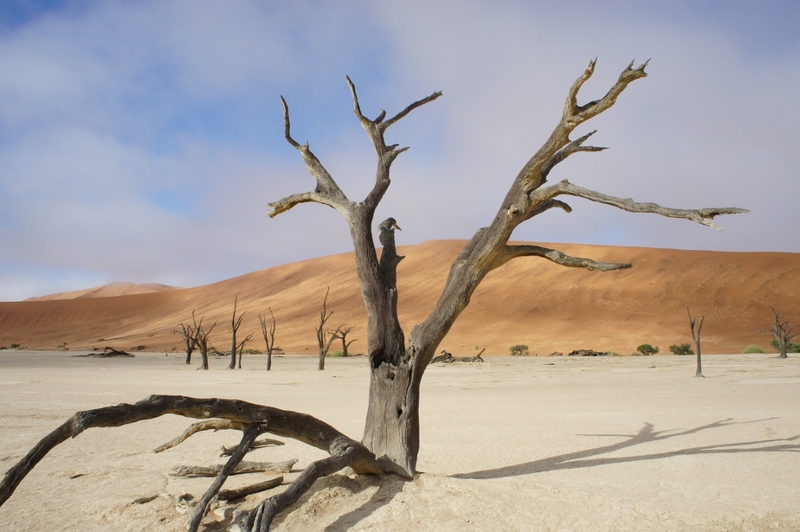 Here, interesting looking dead trees and dried river beds can be found. 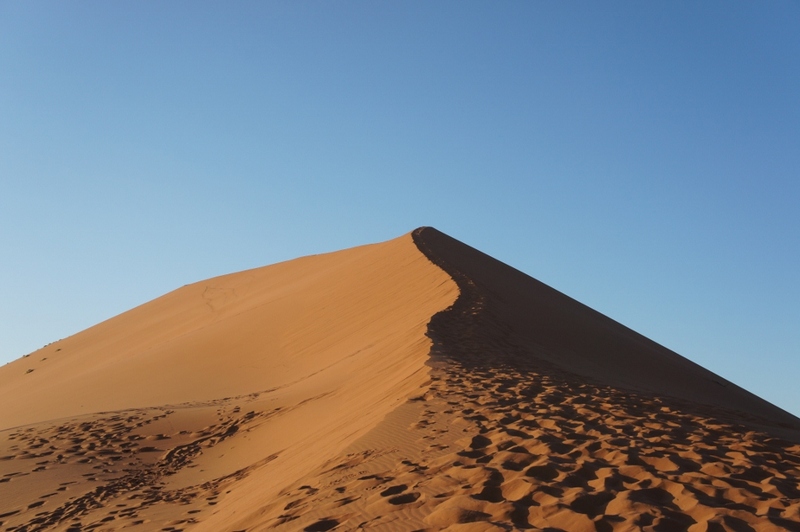 The backdrop of red dunes and blue sky provided the perfect opportunity to take colorful photos. 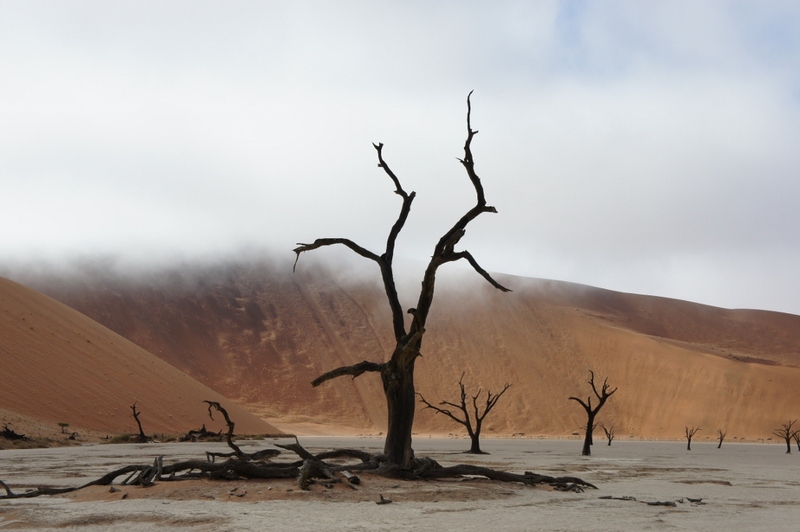 Who knew dead trees could look so cool? We climbed up another nearby dune before heading back and setting off to our next destination. 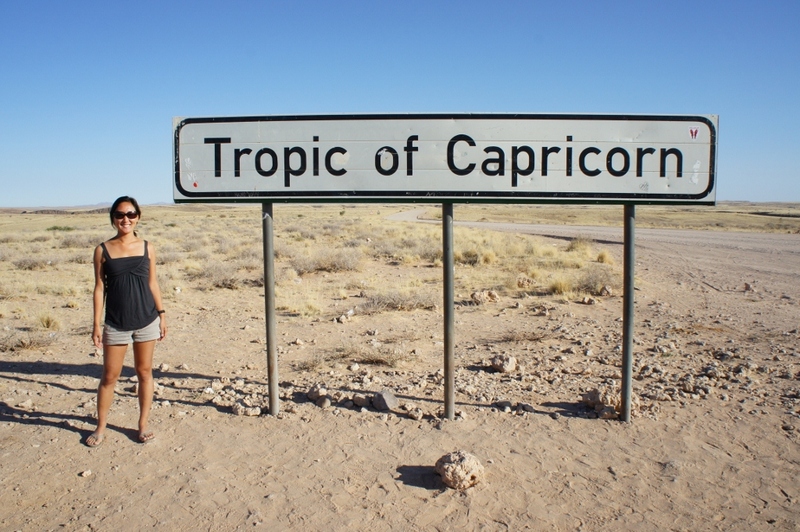 Other notable stops in Namibia have included the Tropic of Capricorn, a flamingo colony and a quick stop to pet a few camels. So what does a typical day consist of you might wonder? Most days include very early mornings and long drives to get us to the next destination. Some days we’ll drive two or three hours, sometimes up to eight hours depending on the day’s itinerary. The roads are bumpy but it’s fairly comfortable in the truck. Our driver, Servius, is the most kind man in the world and takes his job of protecting the lives of 16 others very seriously. I have a soft spot in my heart for Servius and climb in the front of the truck to ride with him on short drives. Chris is the best at spotting game from our truck – it must be the hunter in him. 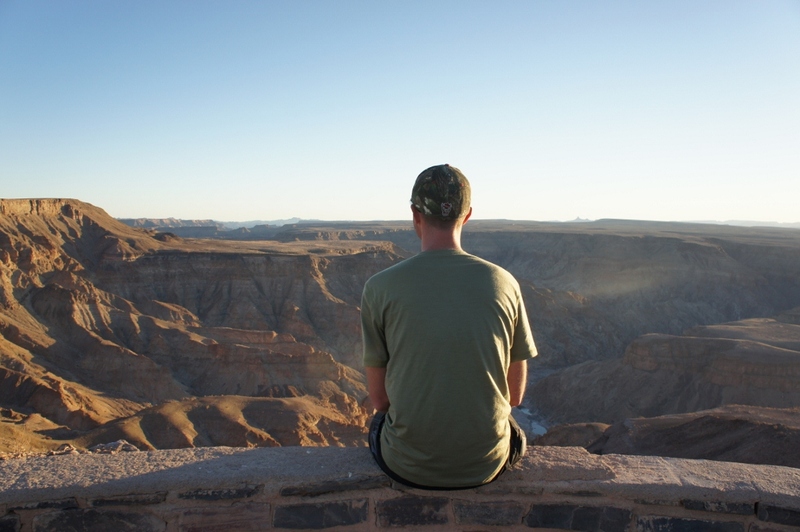 He’ll look out the window and spot kudu, giraffe, gemsbok, springbok, baboons, warthog, zebra, ostrich and hyenas. 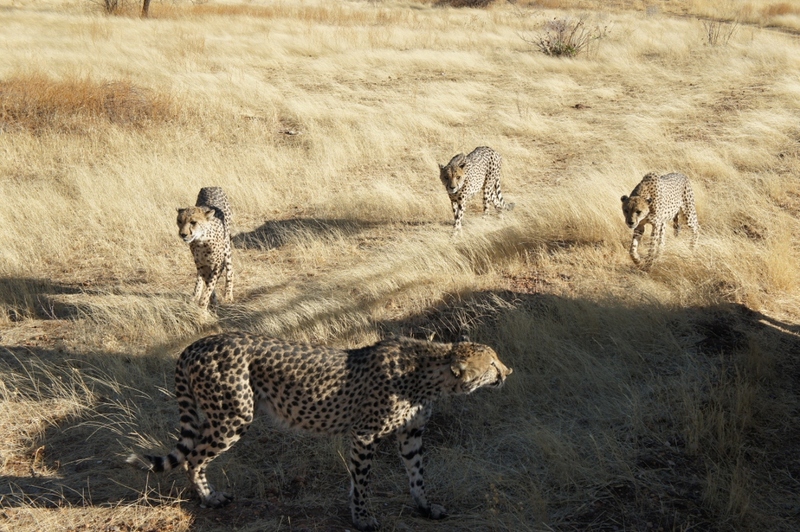 He points them out to me in the distance to make sure I see them before sharing the sightings with the group. Most of the campsites have a full service bar, general store with snacks and souvenirs and a pool area to relax after the long day. We have been pleasantly surprised to learn that almost all of the campsites have drinkable water directly from the tap. Our cook, Onory, is amazing and we enjoy a wide variety of foods including deliciously thick homemade hamburgers, tender chicken that falls off the bone, steaks from the grill, pasta bolognese or authentic African cuisine. Nights are spent hanging out around the campfire, playing cards, laughing at the sayings and pronunciations of words from other countries and developing friendships with the ones that say them. We are very lucky to have an amazing group of people on our truck. We put up and take down our tents every day and after a week of camping, we’ve become accustomed to the daily ritual and so far, we don’t mind living out of a tent. One week down and five to go!